The Commonwealth is sleepwalking towards a human rights disaster, if it goes ahead with November's Commonwealth Heads of Government Meeting in Colombo, where it will be presided over by Sri Lanka's President Mahinda Rajapaksa. Perhaps emboldened by getting away with murder - the army slaughter of some 40,000 Tamil civilians in 2009 - his government has now moved to destroy the independence of the judiciary. It has sacked the Chief Justice for a decision that it finds inconvenient. 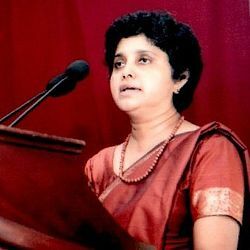 Chief Justice Shirani Bandaranayake, former dean of Colombo Law School and the first woman to be made a Supreme Court judge, is a highly respected jurist. Last year she infuriated the government by declaring unconstitutional a bill introduced by the President's brother, the Minister for Economic Development, which would have centralised political power (especially at the expense of the northern, largely Tamil province) and would have given the minister wide-ranging powers to infringe civil liberties. So the government decided to remove her and 117 of its tame MPs introduced a bill to impeach her on 14 charges of alleged ''misconduct''. The principle of judicial independence requires that no judge should be impeached for doing his or her duty, merely because the decision has upset the government. That is exactly what the Rajapaksa government has done in the case of Dr Bandaranayake. Three of the charges accused her of misinterpreting the constitution. But it is a judge's job to interpret the constitution and she gave it a purposive construction with which most judges - in Australia and elsewhere - would have agreed. Indeed, with two colleagues who joined in her judgment she interpreted the meaning of a key word in the constitution by looking it up in the Oxford English Dictionary - a familiar source of linguistic enlightenment in courts throughout the Commonwealth. But not for these 117 MPs. Before politicians sack a respected judge, they must at least afford her a fair trial. So to whom did the Speaker, Rajapaksa's elder brother, entrust this task? To a ''Star Chamber'' of seven cabinet ministers. It sat in secret, refusing the Chief Justice's request to admit the public and refusing to have international observers. It declined to be bound by any rules about the prosecution bearing the burden of proof and it gave her no time to prepare any defence - she was presented with 1000 pages of evidence and told to be ready for a trial starting the following day. The tribunal chairman told her expressly that it would allow no witnesses, whereupon she and her counsel walked out, despairing of any fair trial. The next day, in her absence and without notice to her, they called 16 witnesses whom she could not in consequence cross-examine. The result was a foregone conclusion. She was found ''guilty'' on three charges of misconduct on evidence that could not stand up in any real court and could not in any event amount to ''misconduct'' under any sensible definition. For example, the fact that her bank had addressed her as ''Chief Justice'' on her statements was regarded as an abuse of office justifying her removal. The Supreme Court quashed the Select Committee's findings of guilt, but the President refused to obey their orders. The President sacked her and appointed the government legal adviser, who had no judicial experience, as Chief Justice in her place. Her impeachment was celebrated with a fireworks display from the Sri Lankan navy and with entertainment, feasting and fireworks supplied by the government. The prospect of the Queen travelling as head of the Commonwealth to Sri Lanka to provide a propaganda windfall - a royal seal of approval - for the host President after his destruction of judicial independence would make a mockery of the core democratic values for which the Commonwealth is meant to stand. Canada has already signalled it may refuse to attend what will be a showcase for the regime, but Bob Carr is determined that Australia will be there, a position that is sure to damage Australia's standing on human rights. Mauritius, an exemplary democracy, is willing to host CHOGM, and that's where it should take place.